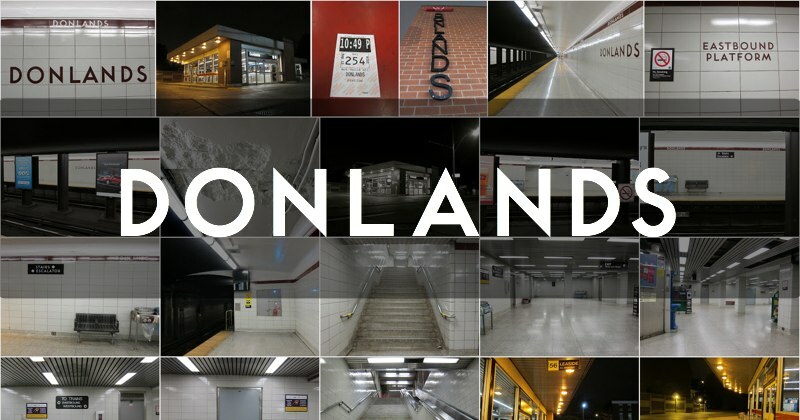 If you were to compile a hypothetical inventory of Toronto’s most romantic subway stations, Donlands would almost certainly not appear on your list. Cramped, pallid and boxy, Donlands is a sleepy Greektown neighbourhood departure point. Not much really goes on here—though that will change should it ever be selected as the transfer point for the Relief Line, if they ever build it. In the early 80’s, TTC Chief General Manager Alf Savage advocated for a relief line (using ICTS cars!) from Union to Donlands, against opposition from city planners and suburban politicians alike, who flinched at the expense and who also wished to promote outlying regional growth centres over the downtown. During the debates, the TTC repeatedly noted that the underpinnings for Donlands were specially built so that a connecting tunnel could be dug without interrupting the Bloor line. But nothing ever came of it. The grey concourse originally held the fare collection booth; when the current street-level building was built in the ‘80s, the booth moved upstairs. What does it say about our identity, when we ascribe meaning to a location, in terms of the people we met, and the encounters we’ve had? The heart is a strange and curious organ. Donlands opened on February 25, 1966 as part of the Bloor-Danforth line. East of the station lies the underground wye connecting the system to the Greenwood subway complex. On August 6, 1977 a pile of rubber pads being stored in the wye caught fire, forcing the evacuation of over 2,000 passengers and sending 50 to hospital.